Twice in the past month I have given watercolor demonstrations for art guilds in the southeast Michigan area. The groups have been very gracious. I especially enjoyed the Romeo Art Guild, who paid attention to every detail of my demonstration, asked great questions and gave me such a warm welcome. The photo was taken by my husband, who usually accompanies me and supports me in living my dream. It was taken at the Romeo Guild demonstration. I was showing the group how I "build" a simple landscape with trees. Most of the artists in attendance painted in other mediums so they were curious as to how I developed a painting without using a lot of masking techniques. I really enjoyed this guild and the warm reception they gave me. 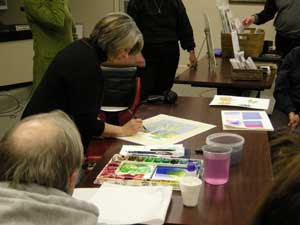 Many of the group's members brought in artwork for the members to critique. Their work was wonderful. There were oil paintings, pastels, and watercolors. What a treat for me to see the talents of the group members! I will be at the Shelby Fine Art Society next week giving another demonstration. I'm looking forward to it!